Many of the Wink fans often ask me for Men's jewelry, they are eagerly waiting for it. Some have been following me since the beginning, six years ago, and can see how my work has evolved and developed. Last December, one of those fans said: "the time has come for the Wink Dude line". Wow, that was enough to get my creative juices going. Designing men's jewelry is no easy task for me. In the past, I've only produced about handful successful designs. The other attempts went straight to the recycle bin in my little studio. This year, I'm already busy at work exploring imagery, shapes and textures to design for the Wink Dude. Stay tuned! 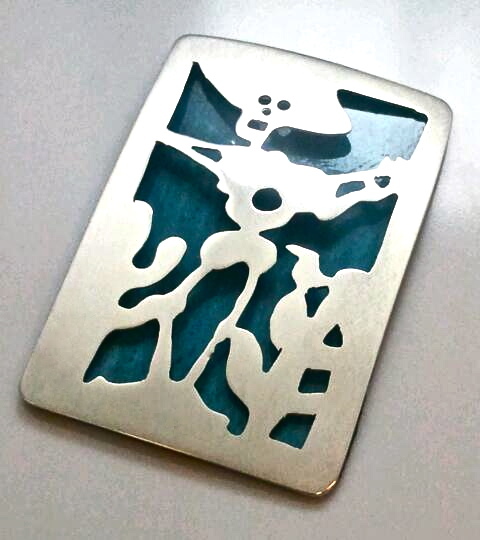 Meanwhile, I leave you with this work in progress pendant of a calaca musician with his sombrero and guitar. I'm calling it Blue Serenade (sterling silver copper and hand-colored copper). I hope to finish it later on today and have it ready for the Mercado Fandango event on Sunday at El Fandango Mexican Restaurant in Old Town San Diego. Hope you can stop by and say hello. Love it!!! Wink Dude is going to be great! Thank you La Chica Boutique!